British Prime Minister Theresa May will meet German Chancellor Angela Merkel and French President Emmanuel Macron on Tuesday to argue for a Brexit delay while her ministers hold crisis talks with the opposition to try to break the deadlock in London. Britain’s departure from the EU has already been delayed once but May is asking for yet more time as she courts veteran socialist Jeremy Corbyn, whose opposition Labour Party wants to keep Britain more closely tied to the bloc after Brexit. “The prime minister has not yet moved off her red lines so we can reach a compromise,” Corbyn said ahead of further talks between his team and government ministers on Tuesday. 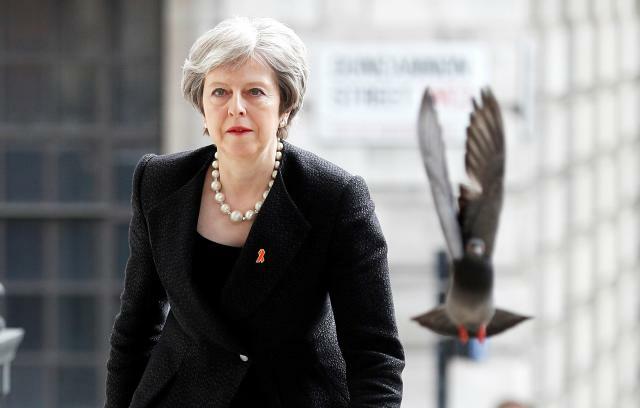 While May travels to Berlin and Paris ahead of an emergency EU summit in Brussels on Wednesday, British lawmakers will hold a 90-minute debate on her proposal to delay Britain’s EU departure date to June 30 from April 12. The debate has been forced on the government by parliament passing a law on Monday which will give lawmakers the power to scrutinize and even make legally binding changes to May’s request to extend the Article 50 negotiating period again. More than a week after Britain was originally supposed to have left the EU, the weakest British leader in a generation warned that Brexit might never happen as she battles to get a divorce deal ratified by a profoundly divided parliament. May needs Labour votes in parliament to get a deal approved. But Labour’s demands include keeping Britain in a customs union with the EU, something which is hard to reconcile with May’s desire for Britain to have an independent trade policy. The Telegraph reported Labour and the government were still discussing both a customs union and the idea of holding a confirmatory referendum on any deal they agree. Both ideas are anathema to many in May’s party, whose rebels have helped defeat May’s divorce deal three times this year. The EU has been clear it will accept a softer Brexit. If Britain’s exit is delayed beyond May 22, the EU has said it will have to take part in European Parliament elections. The British government on Monday took the legal steps necessary to take part in that vote. “It does not make these elections inevitable, as leaving the EU before the date of election automatically removes our obligation to take part,” a government spokesman said. EU leaders, fatigued by the serpentine Brexit crisis, must decide on Wednesday whether to grant May a further delay. The decision can be vetoed by any of the other 27 member states. Dutch Prime Minister Mark Rutte said it was “crucial to know when and on what basis (the) UK will ratify the Withdrawal Agreement” as the EU considers May’s request to delay. While the EU is not expected to trigger such a potentially disorderly no-deal exit, diplomats said all options were on the table - from refusing a delay to granting May’s request or pushing for a longer postponement. Brexiteers in her cabinet insisted on at most a short delay, while Mark Francois, deputy chief of the Conservatives’ Brexit-supporting faction in parliament, demanded she resign and called on the party to vote on forcing her out - even though there is no formal provision to do so before December.